I love this title. 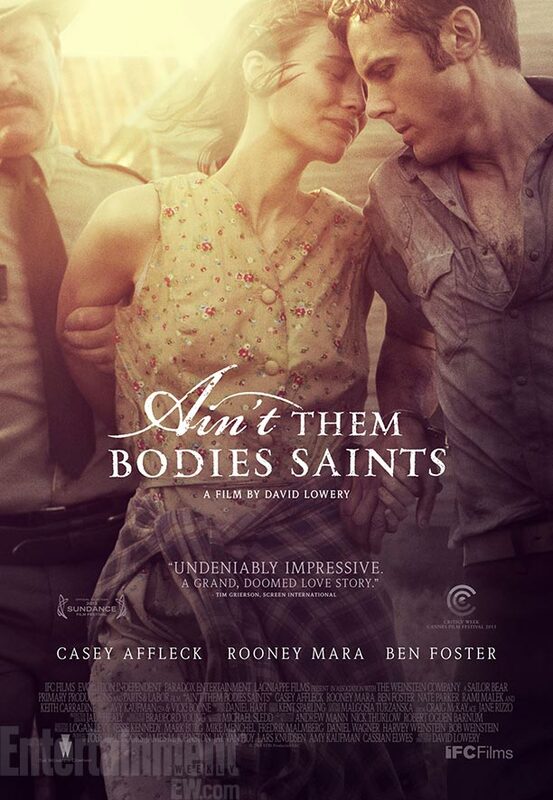 Ain’t Them Bodies Saints. Definitely takes the prize for “Best Film Title of 2013,” so congrats for that. I always have to make a decision which film poster to use when for my posting. Sometimes I use a foreign poster, sometimes I use the alternate poster, sometimes a fan-made poster or even the DVD release poster. I like a poster that conveys a particular message about a film. It’s not as important in the alternate posters (which usually are abstract art pieces which may be indecipherable if you haven’t seen the film), but it’s a necessary requirement for most films. And I love this poster. It perfectly captures the mood and the beauty of the film. That particularly sun-drenched, low key color scheme, that brilliant gleaming sun over Rooney Mara’s shoulder, and that look between Casey Affleck and his onscreen wife. Now, if I wanted to quibble, I could probably do some about Affleck’s expression. He doesn’t seem nearly as upset as Mara, and I can’t tell if his eye is looking at us – the audience – or if it is looking down and across Mara’s body to something on the ground near the trooper. Maybe he’s trying to capture every blade of grass in his mind before he is unceremoniously thrown into the police cruiser and hauled off to jail, but, if I were him, I would focus my attentions on my beautiful young wife that I won’t be seeing again for a very long time. To each his own.